Create a script that returns the data you want to monitor through snmp. the output should be cleaned from whitespaces. My examples monitor sensor data from ipmi by creating cron script that outputs ipmitool sensor data to a temp file every two minutes. And then parsing it with snmp_ipmi from github. Cron script below. extend "System Fan 1" /usr/lib64/nagios/plugins/custom/ipmi/snmp_ipmi -f /tmp/ipmi_sensor_list -u "System Fan 1"
extend "System Fan 3" /usr/lib64/nagios/plugins/custom/ipmi/snmp_ipmi -f /tmp/ipmi_sensor_list -u "System Fan 3"
extend "System Fan 4" /usr/lib64/nagios/plugins/custom/ipmi/snmp_ipmi -f /tmp/ipmi_sensor_list -u "System Fan 4"
restart snmpd and run the following command to see your snmp data. example output below. NET-SNMP-EXTEND-MIB::nsExtendArgs. "System Fan 1" = STRING: -f /tmp/ipmi_sensor_list -u \"System Fan 1\"
NET-SNMP-EXTEND-MIB::nsExtendArgs. "System Fan 3" = STRING: -f /tmp/ipmi_sensor_list -u \"System Fan 3\"
NET-SNMP-EXTEND-MIB::nsExtendArgs. "System Fan 4" = STRING: -f /tmp/ipmi_sensor_list -u \"System Fan 4\"
Setup a snmp test in Nagios/OP5 using check_snmp. because the output from the script is strings check_snmp has to do string conversion to integer, which it can if you configure it correctly. 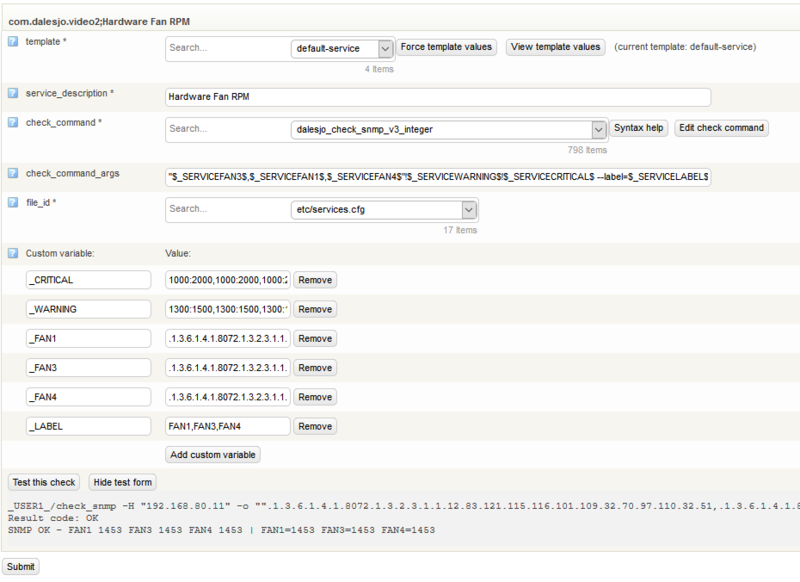 The example below does one check_snmp request it returns the value for all 3 fans we configured above. if any of the 3 Fans RPM value is outside of 1300-1500 rpm a warning is generated, if the rpm value is outside of 1000-2000 a critical is generated.